Point-of-sale systems are using Smart Tipping, which coaxes bigger tips out of customers and gets them out the door quicker. As you probably know if you’ve ever worked in a tipped profession, traditional tipping methods don’t always work out in favor of baristas, cashiers, servers, and bartenders. Some people are great, and take the time to tip 20% or more every time. Others tip nothing, or leave incredibly rude notes on the tip lines of their receipts. Businesses can set up their tip amounts any way they like, including the traditional amounts of 15%, 20%, and 25% of whatever the total purchase is. If you want to tip an amount other than that, you have to calculate and enter it manually. 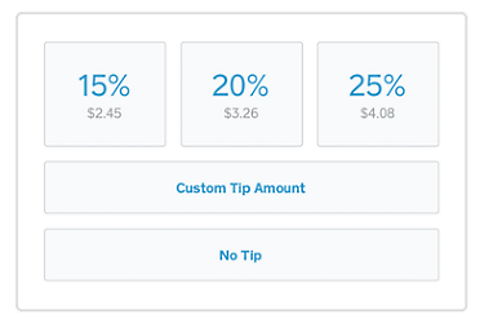 Offering No Tip is certainly an option, but as the very smallest bottom option, your eye is less drawn to it than it is to the much larger suggested tip amounts at the top. The part where it gets tricky is Smart Tipping. As Square describes, Smart Tipping means that if a transaction is less than $10, the tip options will automatically be $1, $2, $3, or No Tip. As the New York Times points out, that means you might end up paying a $3 tip on a $4 cup of coffee. Peter Post is the managing director of the famed Emily Post Institute, those eternal advocates of better etiquette for everyone. On the subject of tipping, Post told the NYT, “We recommend 20 percent absolutely.” But as Forbes points out, $3 on a $4 cup of coffee is a 75% tip! Still, it’s a nice round number, and if you start thinking about the singles you pull out of your wallet when you’re having lunch with friends instead of calculating percentages, $3 seems easy enough. That’s the kind of thinking that Smart Tipping depends on. But as people continue to debate why tipping should be banned in favor of simply paying those people in tipped professions a living wage, the way tips are changing is something we all have to live with. As Forbes points out, newer POS systems like Square streamline and speed up the process, allowing you to get out the door with your latte that much quicker, so you probably aren’t even thinking about that $3 tip.